In the immediate term, we are initiating work on the regional bike plan component that seeks to wrap a viable and vibrant bicycle plan around a core of issues (mobility, economic development, and environmental and human health) as one catalyst for realizing solutions to some of the region’s most pressing problems and to harness the opportunities inherent in the region’s wealth of natural and historic features, principally, the region’s lakes and riparian corridors. 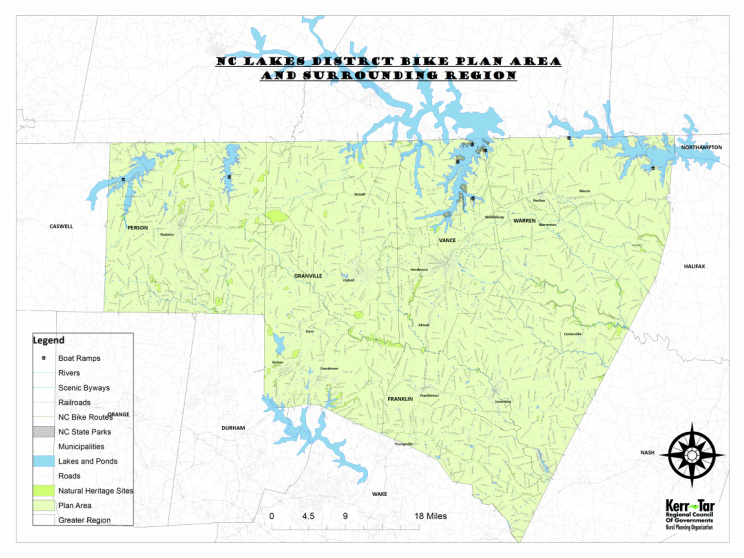 The planning area encompasses Person, Granville, Vance, Franklin and Warren counties and the communities of Roxboro, Oxford, Stovall, Henderson, Middleburg, Warrenton, Norlina and Macon. The focus of the plan will to be link the region’s myriad of lakes, riparian corridors, and recreation areas; reinforcing and enhancing the region’s existing character: compact traditional town centers surrounded by sparsely settled rural areas of forests, farms, lakes and rivers. The goal of the plan is to link the region’s lakes utilizing a system of on- and off-road trails. Integrate identified river basin priority riparian corridors into planned off-road road bicycle network. Who will work on the Plan? Plan development will be coordinated by Kerr Tar Regional Council of Governments’ Planning Department staff, with contributions of in-kind assistance from local communities, county and municipal planning staffs, and local GIS planners. COG and local staff may be supplemented by an intern to assist with plan development, including outreach and research. The Plan will need active input from people representing a variety of viewpoints and interests not only to ensure that the plan is comprehensive but that it has champions who can carry the Plan through to implementation. An active group of stakeholders and partners will be critical to the long-term success of the plan and will include generally, local citizens, local and state planning professionals, and organizations concerned with bicycling, recreation and other planning focus areas. There are a number of bike clubs that have already been identified in the region and there are more that will continue to surface. Local events like the Mayo Lake Triathlon and the Ride between the Lakes Bike Race represent existing interest that can be leveraged to support a comprehensive bike plan for the region. Lessons learned from these events and others will be used to inform the development of the plan. In addition, the success of the Kerr-Tar Lakes District Bicycle Plan will depend partly on the recognition and incorporation of work that has gone into previous planning efforts including existing adopted local and county greenway, bicycle, pedestrian, comprehensive transportation, economic development, environmental protection, and human health and recreation plans.